So here we are holding our stomachs after one too many (celebratory) breakfast pancakes, looking out over an all-encompassing mountain panorama in the fancy resort town of Banff, Alberta, CANADA (!) trying to fathom how we actually got here. ‘Definitely the right decision tackling the route from south to north.’ We agreed wet but triumphantly as we rode into our final destination recalling a distant memory of the New Mexican desert. 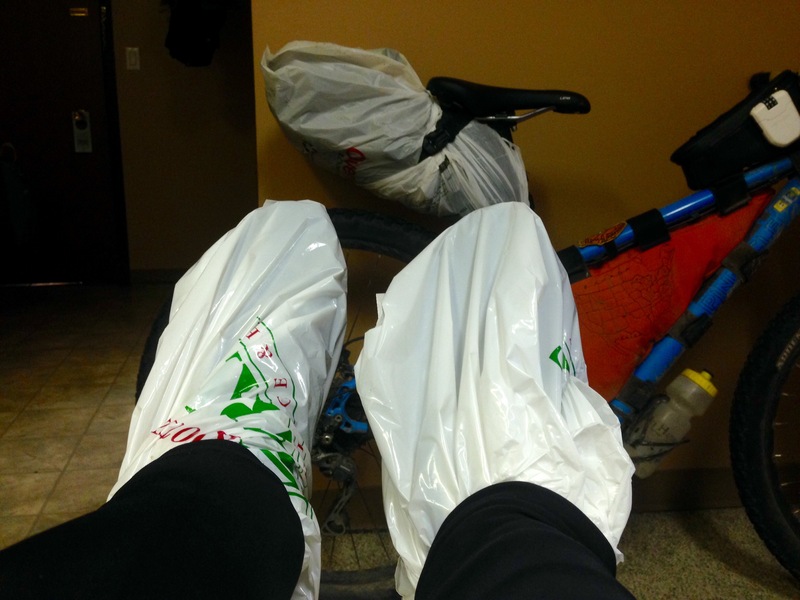 ‘Yeah for sure, although my toes would certainly be less frozen..’ I had to add. 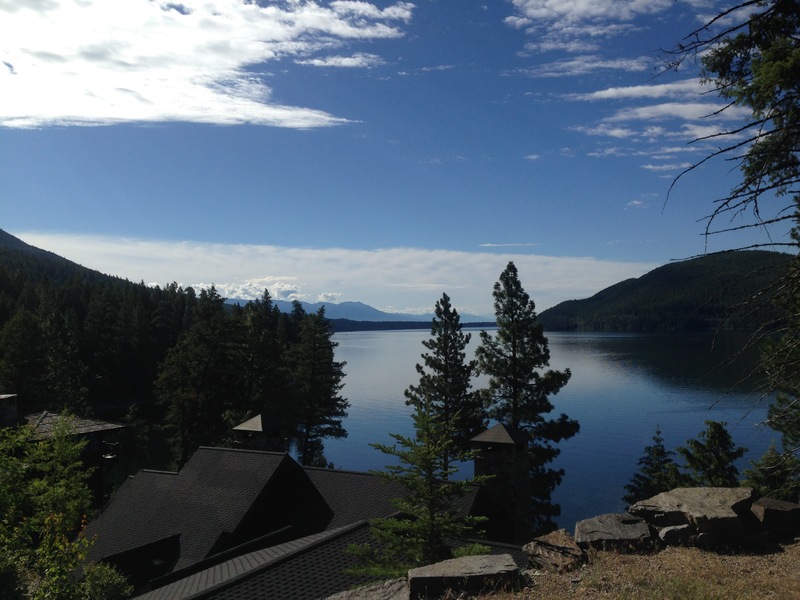 But first let’s pick up where we left it a few days back in Whitefish and give you the final piece to the puzzle. From one fancy resort town to another, Whitefish was a nice place to stop and refuel although, and this may sound silly, adjusting to bigger crowds of people and an overabundance of ‘stuff’ no one really needs has been somewhat an effort after/in between the simplicity of the wild. 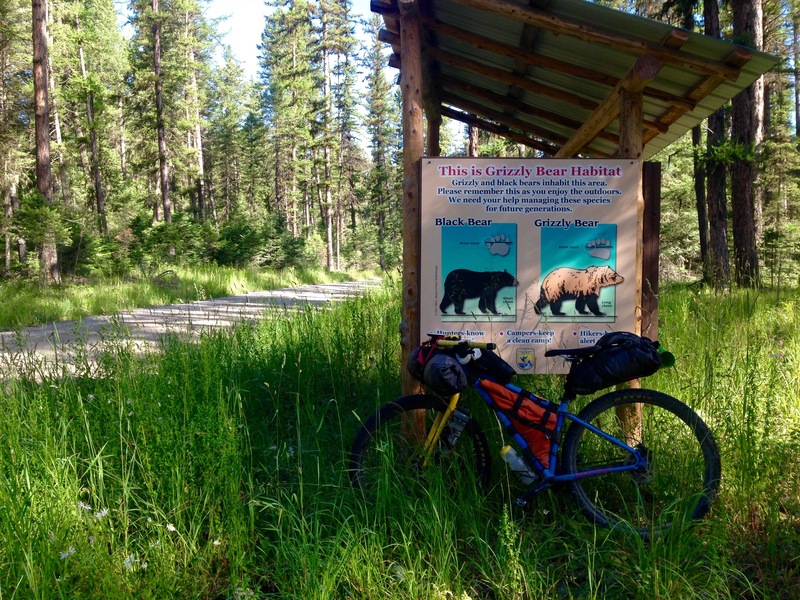 After some very wet starts the past few days, blue skies and milder temperatures made for easy riding out of town the following morning, passing the glorious Whitefish Lake before hitting the gravel and more bear country. Our aim for the day was Eureka or, if the weather held out, we could save some cash by stopping at Grave Creek campground 12 miles before town making for an 80 mile ride. Despite the route map including an elevation profile and further descriptions of what may be expected on an upcoming stretch, it’s been near enough impossible to judge how easy or tough a certain day would be. Supposedly flat stretches have been made tedious by lava sands or 20mph headwinds and some of the ‘killer passes’ surprised positively with gentle gradients and smooth surfaces…you never quite know what you get! 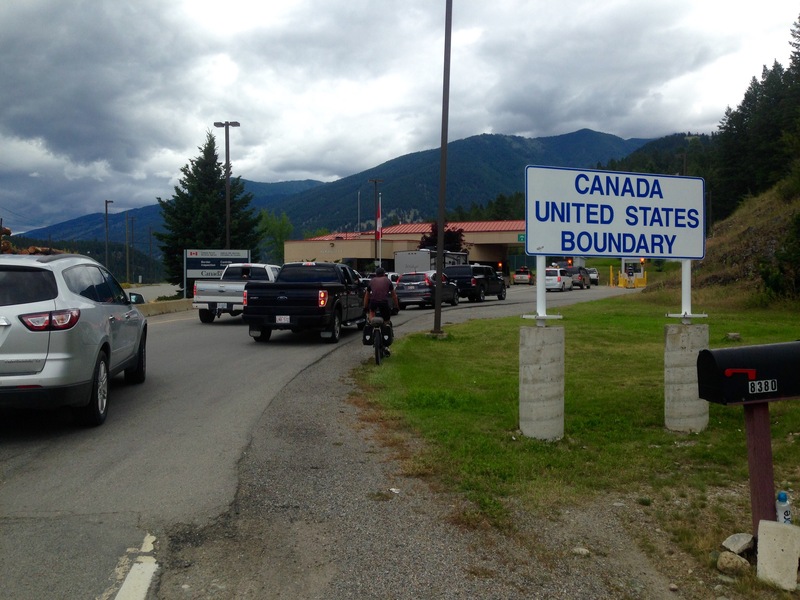 That day was one of those where progress was made more easily than expected – probably due to the excitement about the Canadian border crossing building. The stretch was also less ‘wild’ than we thought it would be – probably at least partly due to passing about 30(!) other (divide?) riders. 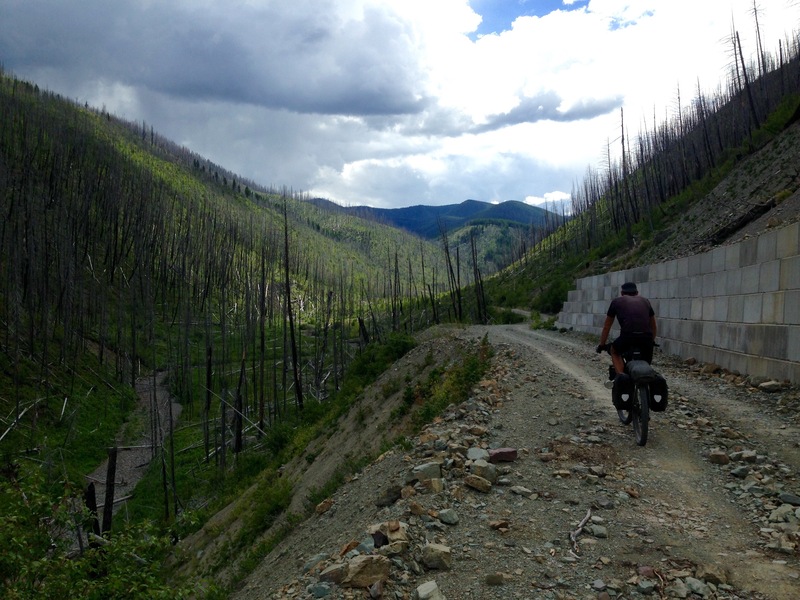 The definite highlight of the day was the Whitefish Divide with its eerie but strangely appealing landscape of acres and acres of burnt trees. 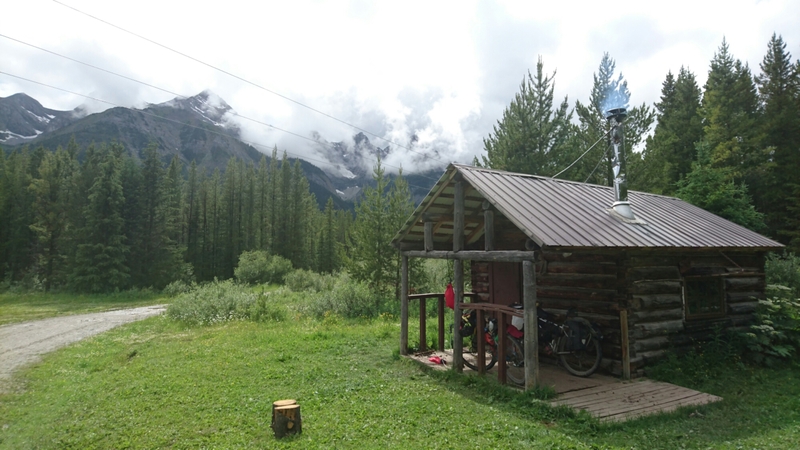 A storm was also brewing in the background and we started the usual costume changes of arm warmers and rain jackets on and off at 5 minute intervals but by the time we reached Grave Creek campground we were confident we had successfully escaped it. Unfortunately that wasn’t the case and just after we cooked and ate some dinner we were met with the heaviest rainfall yet and it didn’t stop until the early hours of the following day. With the worry of ruining all our equipment so close to finishing I didn’t get much sleep, although the tent held out and at least we stayed relatively dry inside. As you can imagine packing up in the morning was little fun and I may have felt the lowest yet but it was only 12 miles to Eureka and another 9 miles from there to the border crossing in Roosville. Too wet and cold to get the stove out, for the first time we decided to set off with an empty stomach. But it didn’t take long for things to brighten up – literally – as the sun came out and we bumped into Chili & Pepper in Eureka. They had already completed the route, having got a lift back from Banff last night. Wow, with that in mind, a substantial breakfast and yet another laundrette stop later, we were geared up to get some miles in! Up came the border crossing and I’d love to say it felt like a milestone but actually there’s not much to report about the actual crossing. A quick show of passports and the usual ‘On the Divide? 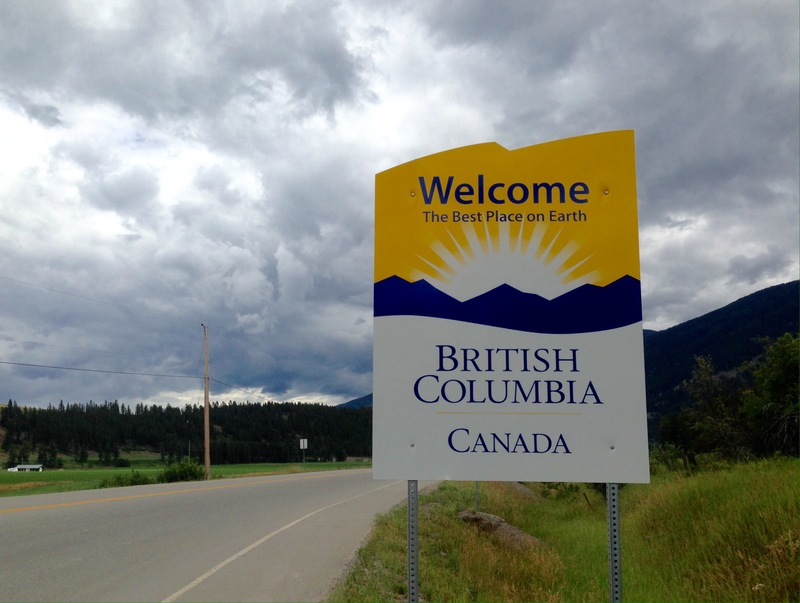 Have you guys heard about that guy who did it in like 18 days?’ ‘Yes, 13 days 22 hours actually…’ chit-chat with the officer and into British Columbia we were. It felt great to have a hot shower and be able to dry all our stuff out in Elko but what felt even better was returning a tiny bit of ‘trail magic’ offering a wet rider who put his camp up outside to use the shower and hang out in the warmth. The next morning the weather looked a bit better but more rain was forecast for the afternoon. Our aim was Elkford some 60 (road) miles away. 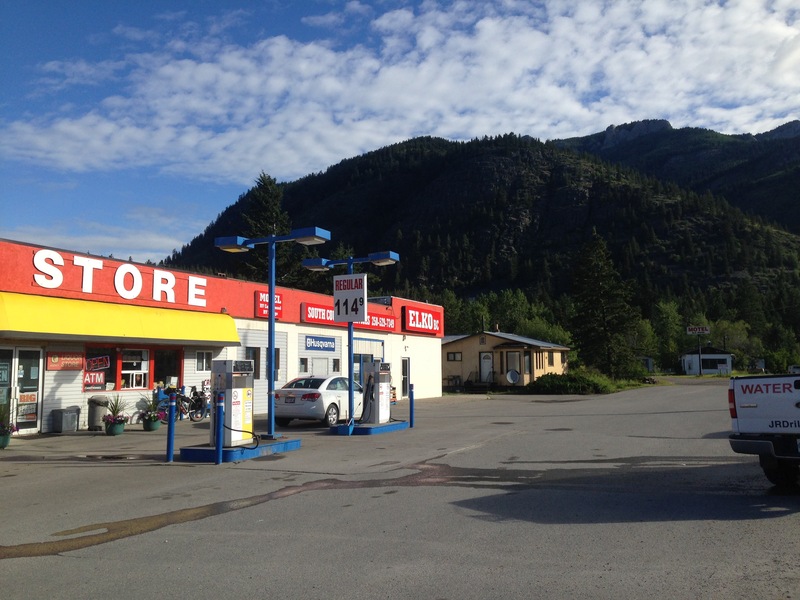 When we got to Sparwood – note, its main tourist attraction is ‘the world’s BIGGEST truck’ – the storm was moving in but this time we were mentally prepared for it and took some further precautions to make sure our kit stays as dry as possible. Elkford was reached and yet another motel occupied. With the only local restaurant closed, we ‘enjoyed’ a microwave lasagne from the store opposite. The rain didn’t stop. The remaining distance from there to Banff was ‘only’ 109 miles and only set to pass one more Continental Divide crossing (actually called Great Divide in Canada). 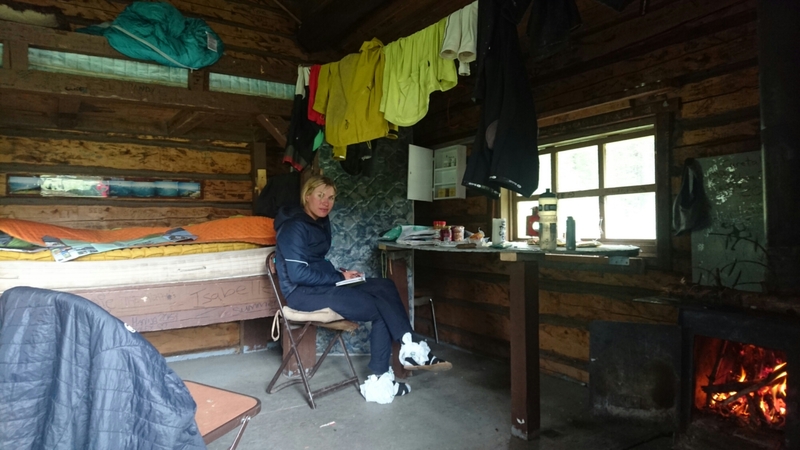 We really wanted to tackle the distance in a day but the weather plus the fact that an extra night in a hotel room would be pricey made us decide to split the stretch and so we headed just 40 miles ‘up the road’ to Tobermory cabin. And we were glad to have done so. Maintained by the BCFS (British Columbia Forestry Service) this little cabin in the woods was indeed ‘rustic’ (no running water, bunk beds and plenty of rat evidence) but super charming at the same time. The best thing was the little wood burner! Just to keep things exciting so close before our adventure would draw to an end, our night’s sleep was disrupted not only by the sound of the resident rat(s) but also by what sounded very much like a bear! 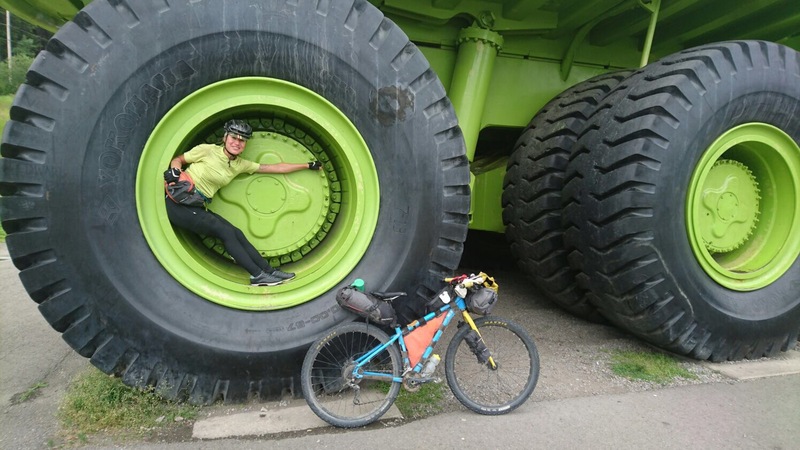 We can’t be 100% sure as we were too scared to go and check, of course, but it was the sound of some heavy footsteps and scratching at my frame bag. 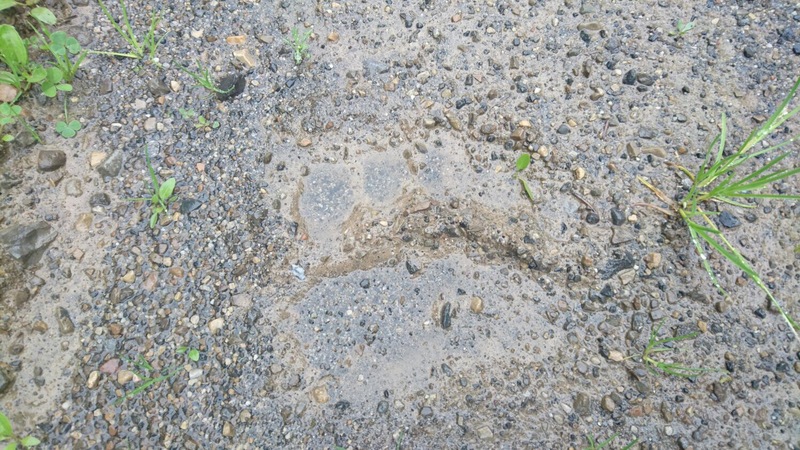 To make things real, Rich did spot some fresh bear tracks in the mud earlier.. But evidently we survived and found no more traces in the morning. Who needs sleep anyway when the excitement of completing our 2600+ mile adventure kicks in?? 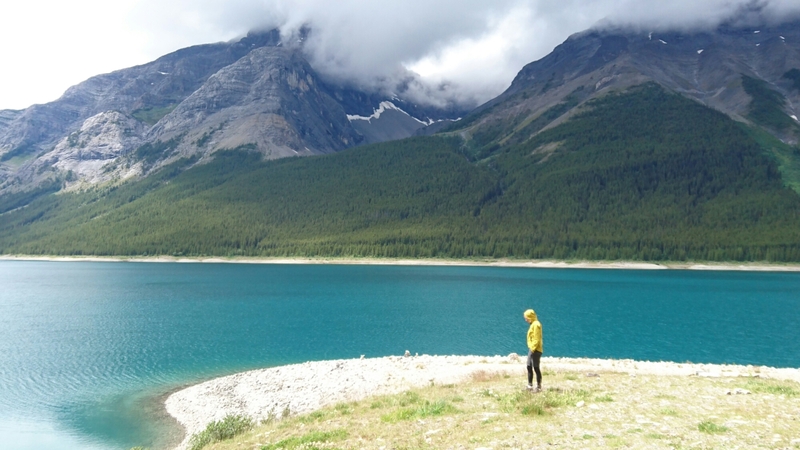 And what a ride it was, past the stunning Spray Lakes Resovoir and offering majestic mountain views. 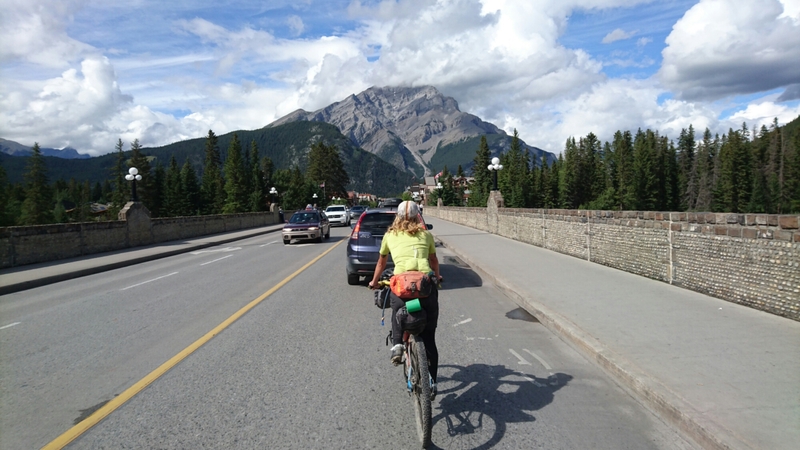 The weather was also better than forecast and apart from a few showers the sun came out just as we tackled the last 12 miles of singletrack into Banff – possibly one of the most fun parts of the entire route. 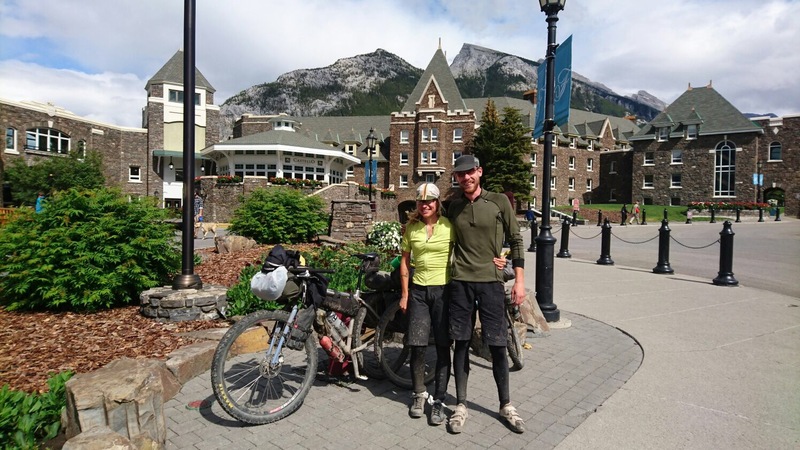 We were definitely proud as we stood in front of the famous Fairmont Banff Springs Hotel, posing for a photo, easily the scruffiest looking people around, but the undertaking would sure take a while to sink in. Thanks so much for following, to all of those who helped us along the way and those who shared some miles with us, we loved (almost) every minute. Fab, amazing, congratulations! What an achievement. Don’t miss out on the Christmas shop in middle of Banff. Kitsch and weird. Enjoy some rest! Brilliant! Congratulations to you both – looks like a stunning finale both scenery and weatherwise. I love the bear paw print! Hope your lovely frame bag wasn’t damaged? How are you going to get used to not eating as much now? Look forward to seeing you, and hopefully loads more photos, next week. Enjoy the last day or two relaxing! Well done guys 🙂 an amazing journey and experience. thanks for all the great tales and photos. Highlight of the trip? Well done, glad you had an amazing time.